The research is defined within the BitBooster project. capacity was ones and tens of megabits per second. For sure, the size of these data and required distances were extremely less than nowadays. Thus, communication industry faced main problems: how to transmit Big Data through LFP (Long Fat Pipes) e.g. between continents and how to avoid congestions in such a connections in more effective manner. Concept of the TCP protocol cannot fill fully all needs in data transmissions of modern society. In FILA group it was decided to investigate new ways for data transition to consume existing network resources more effectively even if the quality of legacy infrastructure is poor. There is an idea to insert the algorithms for available bandwidth analyse in the communication channel during reliable data transmission. Such approach will allow avoidance of congestion even before the congestion happened. Means this “congestion prediction” the effective bandwidth utilisation will be achieved. Also the transport protocol with this algorithm will have quick adaptation to changing of a bandwidth in a connection. FILA group developed alternative protocol. Reliable Multi-Destination Transport (RMDT) is a point-to-multipoint data transport protocol, which provides reliable multi-gigabit Big Data distribution across the world. It works in any IP-based networks and can handle high packet losses as well as high RTTs and jitter. RMDT protocol can be used in WAN networks in order to assure maximum bandwidth utilization. 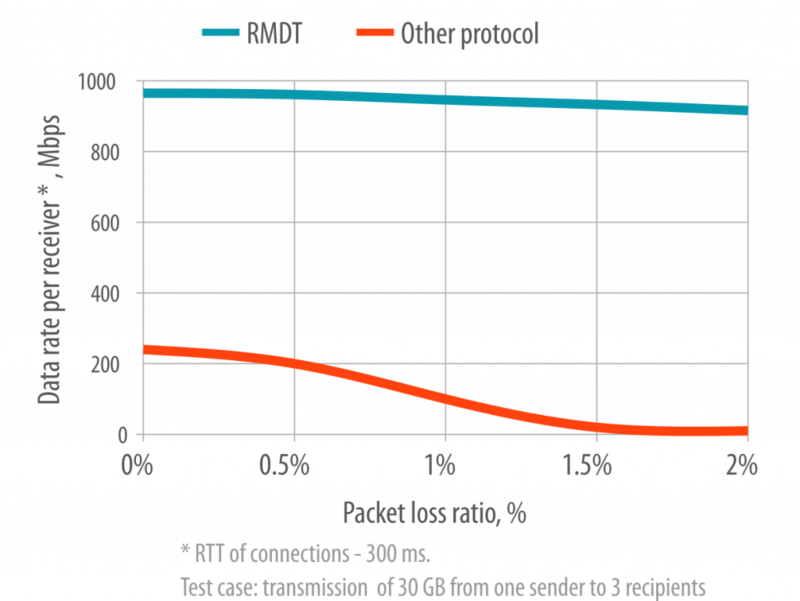 It is resistant against high losses, RTT and delay jitter. Our researches demonstrated that it is capable to provide up to 950 Mbps per receiver in presence of 2 % losses and 300 ms RTT. Due to use of the patent pending ABC algorithms, the protocol is able to deal with very aggressive cross traffic with high efficient rate adaptation, that moves RMDT to the next level of intelligence in comparison with competitors. Under the same conditions competitor's multi destination protocols perform more than 5-20 times slower in comparison to RMDT. FILA group was present in the CeBIT’2017 and illustrated the achieved results on the example of transmission of the FullHD video steaming with data rate up to 10 Gbps (by means of data transmission stream up to 1 Gbps each) and losses of up to 4%. 2. D. Kachan, E. Siemens, V. Shuvalov, Comparison of Contemporary Solutions for High Speed Data Transport on WAN 10 Gbit/s Connections. Proc. of ICNS 2013, The 9th International Conference on Networking and Services, 2013, pp. 34–43. 5. A. Bakharev, E. Siemens, V. P. Shuvalov, Analysis of performance issues in point-to-multipoint data transport for big data. Proc. of the 12th International Conference on Actual Problems of Electronics Instrument Engineering (APEIE), 2014, pp. 431–441. 6. D. Kachan, E. Siemens, V. Shuvalov, Available bandwidth measurement for 10 Gbps networks. Proc. in 2015 International Siberian Conference on Control and Communications (SIBCON), 2015, pp. 1–10. 7. D. Syzov, D. Kachan, E. Siemens, High-speed UDP Data Transmission with Multithreading and Automatic Resource Allocation. Proc. of: the 4th International Conference on Applied Innovations in IT, Koethen, 2016, pp. 51-56. 8. S. Maksymov, D. Kachan, E. Siemens, Connection Establishment Algorithm for Multidestination Protocol. Proc. of: the 4th International Conference on Applied Innovations in IT, Koethen, 2016, pp. 57-60. 9. D. Syzov, D. Kachan, E. Siemens, Algorithm of Handling Out-of-Order Delivery for Multithreaded UDP-based Data Transport. Proc. of: the 5th International Conference on Applied Innovations in IT, Koethen, 2017, pp. 17-23.